Ecstasy withdrawal symptoms include fatigue, lethargy. loss of appetite, and body ache. More on what to expect after ecstasy here. Commonly used for clubbing, partying and raves, ecstasy (MDMA) has acquired the reputation as a ‘safe drug’. However there is no such thing as 100% safe us of ecstasy – ecstasy can have negative consequences for the user’s mental and physical health and in rare cases even cause death. 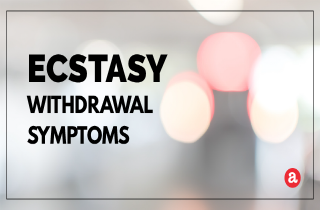 Here, we look at the commonly experienced ecstasy withdrawal symptoms, why they occur, and when and how long the symptoms last. We also look at the options for treatment of ecstasy addiction or finding ecstasy addiction help. You are welcome to share any of your questions or observations in the comment form at the end. We respond to all questions personally and promptly. The drug MDMA, more commonly known as ecstasy or E, is most typically ingested in pill form to engender feelings of social empathy, altered perception of time, arousal, and emotional closeness with others. The drug impacts serotonin, dopamine, and norepinephrine, the brain’s neurotransmitters. This unusual neurotransmitter activity triggers the release of certain hormones, which is why these feelings come about. While taking ecstasy, a surge of serotonin occurs which this depletes the brain of this vital chemical. Because of this, when the effects of the drug wear off, the user feels confusion, an inability to feel pleasure, irritability, anxiety, exhaustion, difficulty concentration and various other after effects. Colloquially, the depressive come-down period following ecstasy use is referred to as Suicide Tuesday or Tuesday Blues because this ‘party drug’ is typically consumed over the weekend and the worst after effects are most typically felt by Tuesday or midweek. What are symptoms of ecstasy withdrawal? Ecstasy withdrawal symptoms: How long? Ecstasy withdrawal symptoms can manifest within some hours of the last use of ecstasy. While some of the other after effects may wear off sooner, the feelings of depression and anxiety can last for weeks. In rare cases, even a single use of ecstasy is seen to cause psychosis in an individual without any previous psychiatric history by way of dopaminergic or serotonergic pathways. However, mosy symptoms of ecstasy withdrawal usually resolve within a day, or two, and don’t require medical attention. The withdrawal from ecstasy can be difficult to navigate and the urge to use the drug may be strong. However, it is possible to treat withdrawal symptoms and the compulsion to use ecstasy with proven techniques. While these treatments are usually reserved for heavy, long term users of ecstacy, it’s worth noting that these treatments can be applied to any instance of substance abuse. 1. Detox – The first phase of recovery from chronic ecstasy use is the detox phase. The idea is to cleanse the body of all the toxins from the drug. Chronic and long term users may find it difficult to recover from their addiction on their own. Abrupt abstinence (going off the drug cold turkey) may also be risky for these people. So, heavy users may need medical supervised detox either from a detox clinic or by way of a complete rehab program at a residential facility. It is important to keep the user hydrated during this phase, because the user could have lost copious amounts of water when high and after effects such as temperature fluctuations may further dehydrate the body. IV fluids and fever reducers may also be needed. Muscle relaxants may also be needed if symptoms such as muscle rigidity are noted. 2. Counseling – Therapy and counseling is the next step to recovery after the detox phase. This will help uncover the reason for the user’s psychological dependence upon the drug. It may also help identify people who may be enabling dangerous behaviors. The first months of sobriety and clean living may be difficult and the dangers of relapse very real. Counseling can ease this process and help the user work though it. Counseling can help the user with modify behavior and learn healthy coping mechanisms to remain sober and clean. 3. Aftercare – Joining a support group such as Narcotics Anonymous or joining a sober living home with other recovering addicts can be effective after care to help the user stay clean. The latter is particularly useful for users who are seen to be at a higher risk of relapse or those who have completed a residential rehab program. Family involvement can be an important part of user after care to prevent relapse. They can help in creating safe environments, monitor user behavior and help prevent triggering situations and involvement with enabling individuals. Still have questions about getting or staying off ecstasy? Please leave them in the comments section below. We do our best to answer all questions personally. I have been taking about a half a pill of ecstacy everyday for close to a year now. I quit cold turkey on Monday. It is now Thursday. I had a massive panic attack on Tuesday and the heavy breathing is still continuing. I just need to know if I need to be worried. I feel fine other than the anxiety and fatigue. Please tell me what I should do or expect. Thank you. Hi Megan. If you don’t feel fine, I suggest that you call the helpline you see on the website to get in touch with a trusted treatment consultant who can help you find the best rehab options for you.